The journey from Split to Zagreb is a rather tedious affair. There are only two trains per day which crawl along at a very slow pace. The main problem seems to be that there is only a single line of track for the majority of the journey. Just a thought, but maybe putting in a second line would be a good idea? Checked into Buzz Hostel which was about a 30 minute walk from the central train station. The hostel and the staff were very pleasant but we were given a really crappy map of the city. Due to some poor planning on our part Chris and I hadn’t eaten all day. This seems to happen quite a lot when you are travelling around all the time. Probably not healthy, but keeping hydrated with a steady supply of Ice Tea is far more important anyway. We didn’t much fancy walking back into the town centre so we found a pub not too far from the hostel and settled down to some steak and chips. By the time we had finished the meal I was getting some pretty serious cravings for Ice Tea so we stopped off at a supermarket and picked up some supplies. Breakfast the next morning consisted of a banana and a snickers bar, as you do. Chocolate for breakfast is probably a little bit mental. I wouldn’t even consider doing it at home. First stop of the day was at a place called Bookska, essentially a bookshop with a coffee shop in it. Very cool and trendy. Not like those Waterstone’s bookshops you see selling corporate death coffees. I suspect a place like Bookska would probably last about 10 minutes in the UK and then Starbucks would move in across the street and force it out of business. 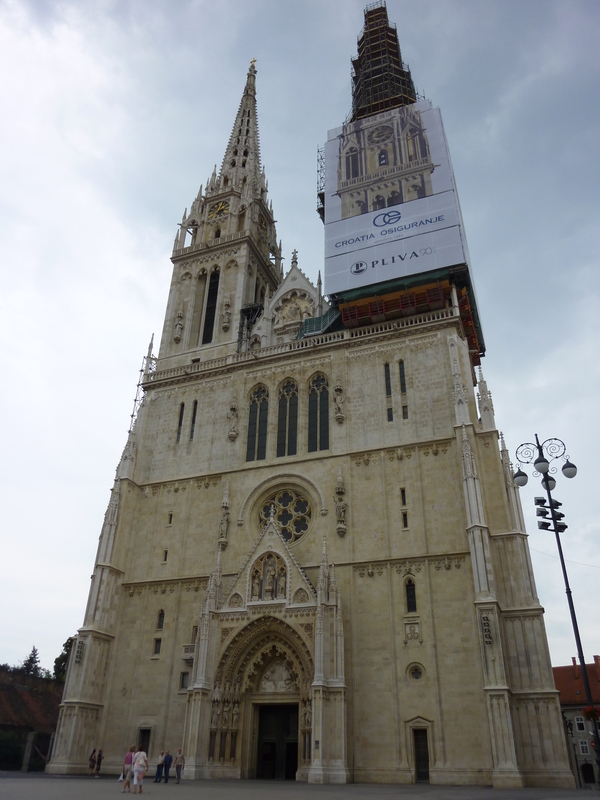 Lonely Planet says that the number one sight in Zagreb is the Cathedral of the Assumption of the Blessed Virgin Mary so Chris and I thought we should probably check it out. I’m sure it is probably really nice, but we arrived to find that the Croatians have ruined it by covering it in scaffolding. Clearly it is still a work in progress. Zagreb Old Town is is very pretty and not nearly as busy as Dubrovnik or Split. Being away from the coast it doesn’t get as many tourists. Saint Marks Church is one of the highlights. Surprisingly for a European church it wasn’t covered in scaffolding. The majority of the church is plain white, but it is the patterned tiled roof which really impresses. It’s one the the nicest churches I’ve seen on this trip. Simple in it’s design but very effective. We also stopped at the Lotrščak Tower. It was built in the 13th century and served as a watch tower to keep an eye on any Turkish army which may want to attack the city. Sensibly the tower is on top of a hill and you get a pretty good view over the city. You can pay to go up the tower if you want a view from even higher up but it probably isn’t necessary. We stopped for lunch at Tip Top, another Lonely Planet recommendation. The special of the day was octopus goulash which I obviously had to try. Chris went for the classic meat stuffed with meat stuffed with cheese. Fantastic food and great service. Next time you are in Zagreb pay it a visit. To walk off the vast quantity of food we had consumed we took a casual stroll through the cities botanical gardens before heading back to the hostel. Our room was empty when we got back and it looked like a good nights sleep might be on the cards. Unfortunately we were woken up at 6am by five British girls checking in and then liberally scattering their suitcases all over the floor. It turned out that their train from Budapest had been “slightly” delayed. They also told us that they didn’t like Budapest which led me and Chris to believe that they either hadn’t looked around the city of had spent the whole time blind drunk and consequently didn’t remember anything. Being British I suspect that the latter statement is probably true. Having stocked up on food and drink at the local supermarket Chris and I headed off to Maksimir park where we spent a good part of the day. One of the boating lakes contained a load of turtles which was pretty cool. In England someone would have stolen them by now. We also paid a visit to Mirogoj cemetary. Not the kind of place you go to every day. Franjo Tuđman the first President of the Croatian Republic is buried there so we paid his grave a visit. 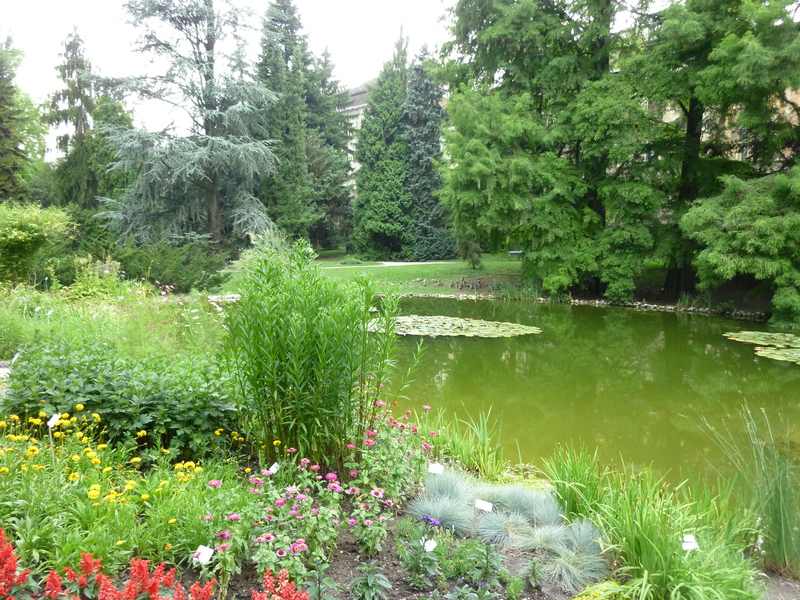 The whole place is very impressive looking and well maintained. A couple of things I noticed; many of the graves contained entire families, others contained two families. Stranger still were the tombs which had names of still living people engraved on them. Not sure I’m too keen on that idea. Having done a fair amount of walking throughout the day we decided to eat somewhere close to the hostel in the evening. Unfortunately I can’t remember the name of the place but the food was very good. Heading back to the hostel we found the “lasses on tour” sat around the room drinking before a night out on the town. They claimed they were getting a train to Split the next day at 7:50am. Needless to say they didn’t wake up in time, much to my amusement. Entry filed under: Croatia. Tags: bookska, buzz hostel, Cathedral of the Assumption of the Blessed Virgin Mary, Franjo Tuđman, Lotrščak Tower, Maksimir park, Old Town, Tip Top, Zagreb.